Today, I would like to introduce Synereo. 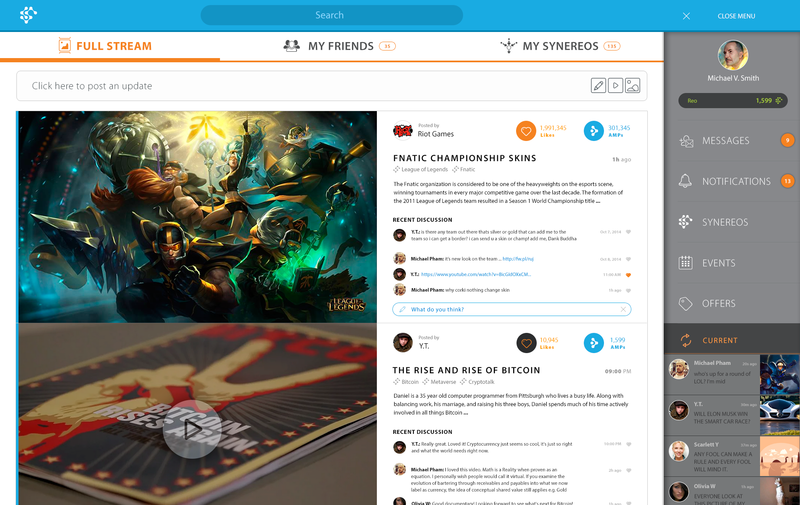 Synereo is a next-gen social network that puts security, identity, and community management directly under the purview of you – the user, respecting your attention and rewarding you for your activities on the social network. With current social networks, you are not the client. You are the product being sold. The value you create by being a part of the network flows upwards immediately, reaching only a select few: those in control of the network. With Synereo, a completely decentralized and distributed network, you are in control. The value you create, provide and share stays in your hands. AMPs, the application tokens for the Synereo network, serve as a way to Amplify the flow of information in the network, increasing its organic reach and allowing it to get to propagate to more peers. You, the user. By participating in the Attention Economy, you receive tokens that you can use to Amplify your voice or to sell on the market. These tokens have an inherent value, as they can be used to increase the chances of a message getting a user’s attention. The more you do for the network, the more your attention is worth. You, the content producer. Through direct compensation for user-generated content, Synereo puts users back in control of their content, to rise and fall directly on the support and passion of its community. Synereo makes it easy to find your communities and grow your project on your terms. You, the advertiser. Advertisers allocate significant resources in an attempt to optimize the reach of their campaigns and outsmart content delivery algorithms. An entire ecosystem of advertising middlemen profit from programmatic advertising; buying and selling ad spaces, bidding for your attention in real time, using retargeting mechanism and attribution models, and generally adding nothing to the quality of the content. Synereo will provide advertisers with the full set of tools necessary to reach their natural audiences, decimating the costs otherwise lost to both these advertising middlemen and to the centralized platform. 1) You can buy AMPs during an initial crowdfunding phase which will fund the development of Synereo and its deployment. The crowdsale will be supported by the Omni Foundation, and will begin at X.2.2015. 2) Registering for Synereo and migrating your information from an existing social network account. 3) Expanding Synereo by inviting users who register on the network and migrate to it. 4) Bounties. People working to contribute to the development, deployment, and expansion of the network will receive AMP rewards for their efforts.